The 19th edition of the ever popular J-Boats festival has eleven different examples of the J-Boats range, featuring four National Championships for the J/88, J/97, J/109 and J/111 Classes. Organised by the Island Sailing Club, the action is exciting and highly competitive, racing on tight Solent courses. For the first day of racing at the Landsail Tyres J-Cup, a light northeasterly breeze built during the day to provide surfing conditions for the high performance classes in the fleet. The 66 strong J-Boat armada enjoyed three races in every class, save the J/70 fleet, which got an extra helping with Race 4. The Central and Eastern Solent was a magnificent sight, blooming with the many colours of the competing J-Boats, crewed by nearly 400 sailors from all over Europe. In the IRC Fleet, defending J-Cup winner, Chaz Ivill's J/112 Davanti Tyres, scored three straight bullets but it was far from easy. "After time correction it was seconds that counted." commented Ivill. "One poor gybe or bad decision is all it takes to drop down the fleet. There are some very good boats and teams in this class." Mike & Sarah Wallis' well-sailed J/122 Jahmali is second and the smallest boat at the regatta, Mike Lewis' J/80 Jester is third. 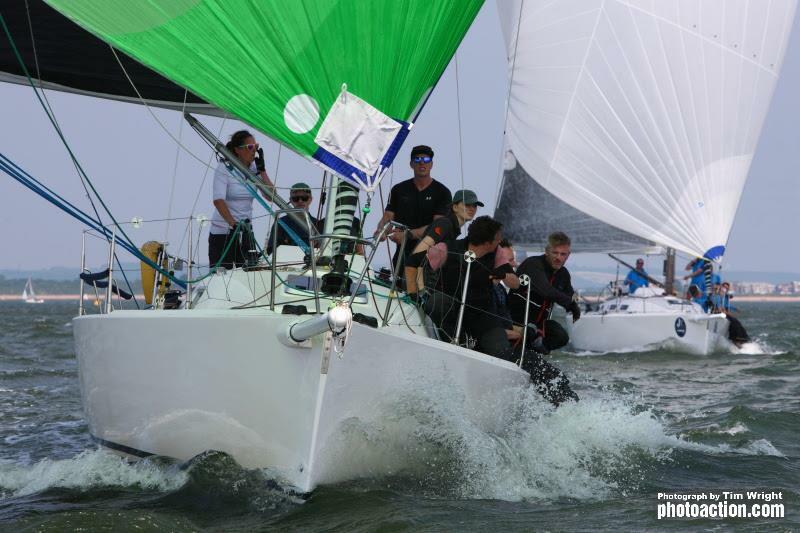 The J/109 National Championship produced extremely close racing, with four teams vying for the lead. Simon Perry's Jiraffe scored a bullet in Race 2 to finish the day in fourth position. John Smart's Jukebox scored three podium finishes to claim third. Joe Henry's Jolly Jack Tar won the last race of the day but it wasn't enough to take the lead. Neil Angel's Diamond Gem won the first race of the day, and followed that with a 2-3 to lead the J/109 Fleet after three races. Michiel van der Meulen's Swiss J/111 Lällekönig scored two race wins today and leads the class after three races. J/111 Class President, Chris Jones at the helm of Journeymaker II, had an excellent day on the water, scoring a race win and two third places to finish the day second, to lead the class for the UK National Title. Paul van Driel & Hans Zwijnenburg's Dutch team racing Sweeny finished the day in third. The J/111 Northern European Class has enjoyed great racing this season, and with 11 teams on the start line, the Landsail Tyres J-Cup provides a tremendous regatta for the J/111 fleet. "It was really close right through the fleet, very competitive starts and mark roundings, and by the third race, we were planing downwind, just amazing racing." commented Chris Jones. "We have a young team on Journeymaker and they put in a lot of energy and enthusiasm. Just three points separate the top three, so tomorrow, we will have to be top of our game to stand a chance of winning." In the 22-strong J/70 Class, five teams made the podium in the four races held. Graham Clapp's Jeepster scored a 2-4-3-1 to lead a class, bristling with talent. Rob Larke at the helm of Mjolnir finished the day on a high, surfing downwind to a second place, and second for the regatta. Paul Ward's Eat, Sleep,J,Repeat score a fist-pumping win in Race 3 but finished the day in third after getting caught in the crush at a mark rounding. Doug Struth's DSP with Geoff Carveth on the stick, had a great day on the water, but a poor result in the last race put the team down to fourth. Clive Bush's Darcey flew out of the blocks winning the first to races but an OCS in Race 3 dropped the team to fifth. "We managed to hold it together today." explained J/70 Class leader Graham Clapp. We had our moments when things didn't go according to plan, as did lots of people, but we managed to limit the damage, and then come back to take a few places to get a decent result. In the last race, Ben Saxton made a great call to stay left, which got us the win." The J/88 National Championship produced an epic battle between the top contenders, Kirsty & David Apthorp's J Dream leads on countback after three races from Gavin Howe's Tigris. Tim Tolcher's Raging Bull is third. In two of today's races. Tigris and Raging Bull had a photo-finish for the line. Dirk and Dianne van Beek's Sabriel Jr. finished the day in style, taking a second in the last race. 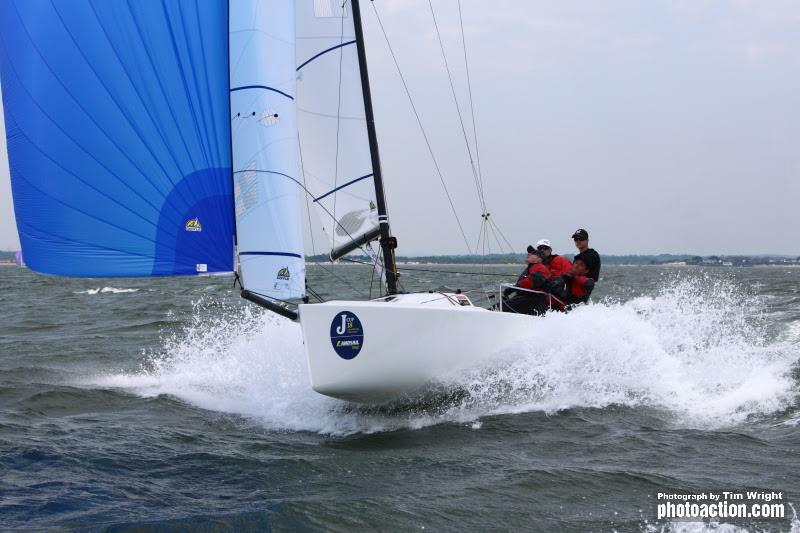 Four teams in the J/97 National Championship made the podium on the first day of racing. Defending J/97 National Champions, Andy & Annie Howe's Blackjack II won the first race. Bob and Jon Baker's Jaywalker the second and Mike Sellers & Chris Miles' High Jinks the third. Robert & Rachel Hunt's Jumblesail 2 scored three podium finishes to end the day in third. Blackjack II are second, but a 2-1-1 from Jaywalker has the team leading the class for the championship. "Really close exciting racing." commented Jaywalker's tactician Roger Barber. "We have had some great racing in recent years and tomorrow to get a good performance, we will have to sail really well." In the J/92 Class, Robin Stevenson's Upstart scored a 2-1-2 to take the lead by a single point from David Greenhalgh's J'ronimo. Jack Bank's Jabberwock started the day with a race win, and two further podium results puts his team in third. "We take a little while to get going!" smiled David Greenhalgh. "We won the last race, so we will continue that tomorrow!" After racing the North Sails Video debrief was well attended by a captivated audience. Frank Gerber, Jeremy Smart, Dave Swete, and Charlie Cumbley were present from North Sails, giving tips and advice to the J-Boat fleet, using drone footage from the day's action. After the North Sails Daily Prize Giving, a crew supper was held at the Island Sailing Club. Racing at the 2018 Landsail Tyres J-Cup concludes tomorrow. With thanks to our sponsors; Landsail Tyres, North Sails, B&G, Fusion, Fastnet Insurance, Grapefruit Graphics, Rigit, Harken, Wight Vodka, Dolphin Covers, Liquimoly, Frontline Image and MMC Divers.